I was born and raised in Florida, pretty much on the coast. I grew up playing in pine scrub and frolicking amongst the dunes on the world's most beautiful beaches. Most of my botanical and herbal knowledge is not coastal at all. While I recognize a lot of coastal plants in the dune habitats, there are very few that I am truly knowledgeable about, and I'm working to fix that. One of the plants I decided to start with is the Sea Grape. Sea Grapes, Coccoloba uvifera, is a sprawling shrub or small tree in the buckwheat, or Polygonaceae, family. It can grow up to 30 feet high (some have been documented to even reach heights around 50 feet) and tends to branch off into multiple trunks if not pruned regularly. Often, on beaches, you won't notice any that are more than 10 feet. The leaves are often red-veined. They are also almost completely round and are typically 8-12 inches in diameter, earning it the name Platterleaf in some areas of the world. Sea Grape blooms starting in March and going, sometimes, through October. The flowers are white or ivory in color. They form clusters and eventually develop into bunches of fruit that start off green and mature to a reddish or purple hue. The fruit is very reminiscent of grapes, though the clusters are formed in a slightly different habit (it's more of a string of fruit than a bunch), which is what gives this plant it's name. 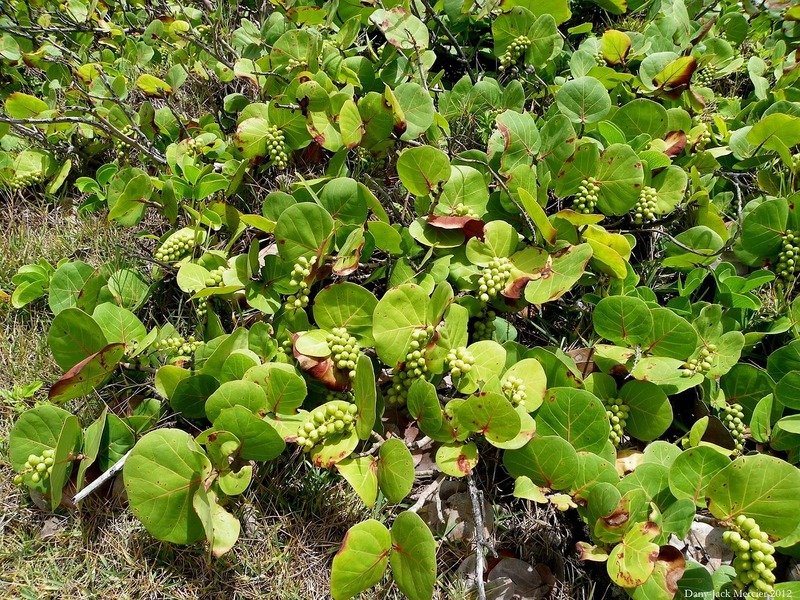 Sea Grape is native to the Caribbean and tropical America including Florida, the Bahamas, and Barbados. These plants are salt tolerant and often are planted to help protect and rebuild endangered dunes. As such, this plant is protected under Florida law and cannot be messed with without the express permission of the person who owns the land that they are on. You can check out the Florida Statute here. This means that wildcrafting or foraging from this amazing plant is illegal in this state (without written permission). However, its sold as an ornamental shrub at many nurseries, and grows well in just about any, well-drained, soil. It's also an excellent potted plant and takes well to bonsai. Just kee in mind that if you are looking to harvest the fruit, you will need at least one male and one female plant in order to produce the grapes as these shrubs are dioecious. The fruit is edible raw and makes great wine and jelly, but be careful of the pits that make up roughly 80% of each fruit. 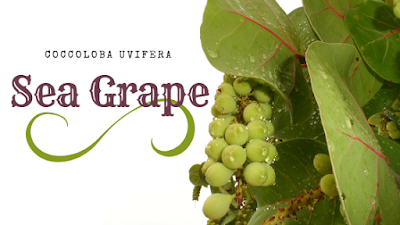 Here's a good recipe I found for Sea Grape Jelly from Authentic Florida. In addition to being edible, Sea Grapes have quite a few medicinal uses. Not only the fruit, but the leaves, bark, and roots, are all useful. The flowers are also major draws for pollinators and make an excellent honey. However, some people may have their allergies triggered by the Sea Grape pollen. Lowers Blood Sugar and Prevents Diabetes- The fruit of the Sea Grape is low in sugar, but high in many vitamins and minerals that are attributed with helping to control blood glucose levels. There have also been numerous studies that show how drinking a tea made from the leaves can effectively lower blood glucose levels. Strengthens the Cardiovascular System- Sea Grapes are a wonderful source of calcium and potassium which help to reduce blood pressure. They also contain good amounts of the unsaturated fatty acids that help to reduce cholesterol, increase the elasticity of blood vessels, prevent oxidation, maintain structure of the arteries, and prevent cardiovascular diseases such as stroke, atherosclerosis, myocardial infarction. Helps the Thyroid- Sea Grapes are an excellent source of iodine which is used by the thyroid. When the thyroid does not get enough iodine, it ceases to work properly and can become enlarged, creating a goiter. Just 30 grams of Sea Grapes a day is enough to prevent a goiter from forming. Helps Treat Diarrhea and Dysentery- This is the traditional use that has the most information. The juice, as well as teas and decoctions from the roots and bark, were used by Native Americans to treat diarrhea, dysentery, and a number of other digestive problems. There is also a traditional tea, used for the same purpose, made from boiling together all the parts of the plant. 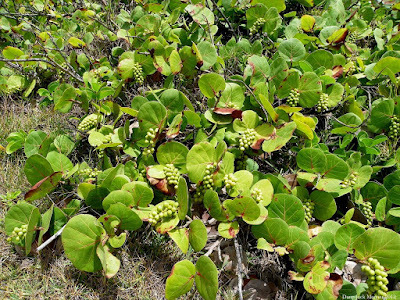 Traditionally Used for Asthma and Hoarseness- Tea made from the leaves of the Sea Grape was used to also treat hoarseness and asthma. Resinous gum from the bark can be used to treat most throat ailments. Contraindications and Warnings- Pollen may cause allergic responses in some hay fever sufferers. I only included a basic introduction to this amazing herb. If I missed anything please let me know in the comments. If you have any questions or comments, please leave them below. If there is anything you'd like me to post on in the future, please leave it in the comments.